Whisk the wet ingredients very well. 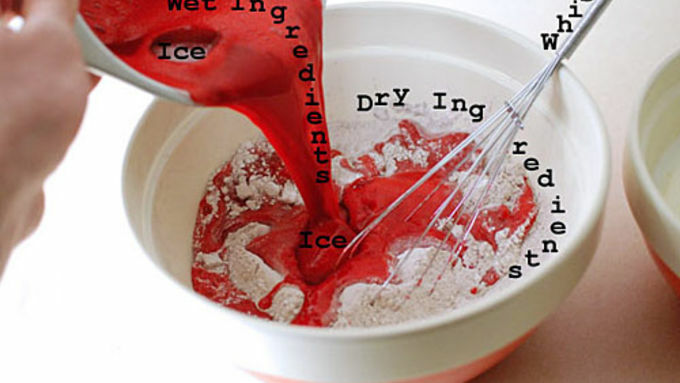 Add the ice to the wet ingredients, then pour it into the dry ingredients. Mix until combined. Sprinkle the chicken with salt, dredge in flour, dip in the batter. Fry at 350°F for 5 minutes until chicken is fully cooked, flipping if needed. Set to cool. Salt immediately. Serve with honey mustard, barbecue sauce, or other preferred condiments. 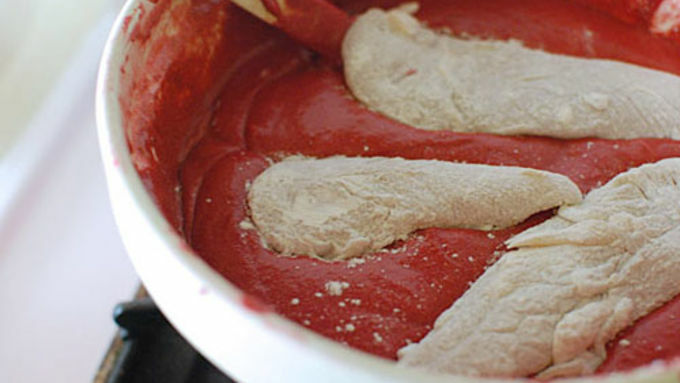 Red velvet may seem like a strange coating for chicken, but the flavors actually go really well together. 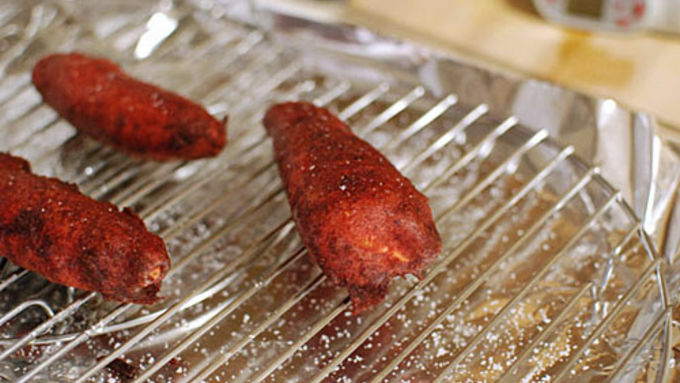 You'll become addicted to these crispy Red Velvet Battered Chicken Fingers! This batter is a modified funnel cake recipe with elements of red velvet cake. The only question was, “What do we dip it in?” I tried BBQ sauce, ranch, and even a simple royal icing. The real winner was a honey Dijon dressing because the contrast of sweet and savory was prevalent in both the chicken fingers and the dip. 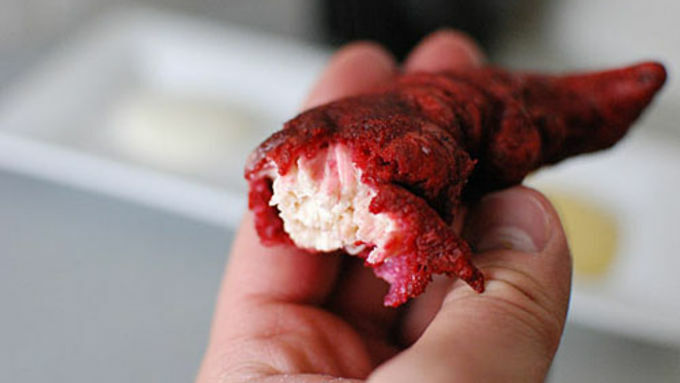 The friends I served this to were very skeptical of the idea, (and so was I after my first recipe attempt failed), but in the end everyone agreed that the Red Velvet Battered Chicken Fingers recipe was a great success. And it was lots of fun to make and eat! The batter is fairly easy to make, but the important thing here is to make it at the very end when the oil and chicken are already ready to go. The chicken fingers had the same texture as the battered chicken from Chinese takeout recipes, but with a much different flavor…red velvet cake! The red velvet taste isn't really in your face though, it’s more subtle – with hints of sweetness, chocolate, and vanilla. 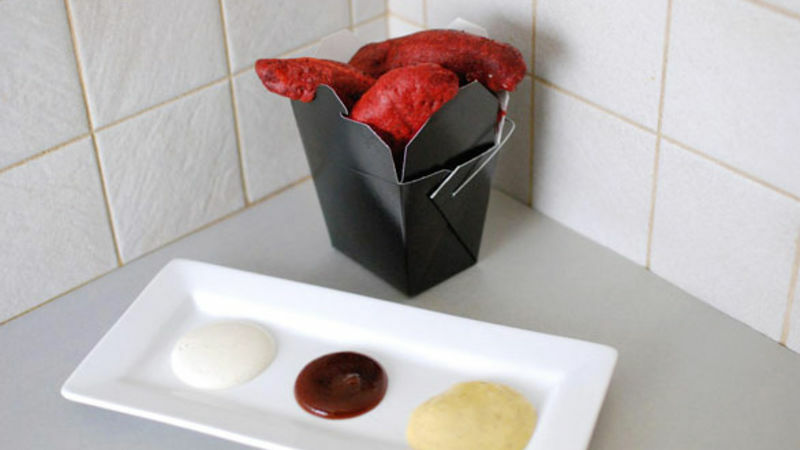 If you're fan of tender chicken and the perfect mix of sweet and savory, then these Red Velvet Battered Chicken Fingers are for you!